In a recent blog post, Eva Petross shares the story of a man named Suleiman. He’s a Christian of Muslim background who helps refugees and immigrants in East Africa get ready to return to their native countries to live and do ministry. Suleiman grew up with the traditional religion of his parents and grandparents. He attended a church for a while as a teenager. Eventually, he became a devout Muslim and an avid student of the Koran. His life as a Muslim culminated, like it has for billions of others, with Haj, the pilgrimage to the holy city of Mecca. One of the big moments of any Haj is walking in circles around the Ka’ba, the structure where the sacred black stone is kept. And in that place, at the holiest of holy sites, in the midst of a sea of the faithful at one of the most sacred moments of his religion, Suleiman lost his faith. He began asking people around him, people he trusted as spiritual leaders, What are we doing? Why are we doing it? He was told to stop asking so many questions. So he did. But he also stopped being a Muslim. And in losing his religion, he began to find Jesus. John seemed to think so. Some of the folks who were coming to hear him preach were maybe coming to challenge him or reinforce their prejudices. But maybe some were coming for some of the same reasons Suleiman went to the Ka’ba. It was a religious experience: a prophet in the desert who preached that God’s people Israel needed the same transformation as the most unregenerate of pagans. They weren’t walking in circles around him, but all that business about being immersed in the Jordan River was full of biblical imagery and import. And the Pharisees and Sadducees: any event that would attract both of them to the same place must have been something. The Pharisees were the sticklers for the traditions of the fathers, for studying and knowing the Law of Moses and the centuries of commentary that had grown up around it like a hedge. They were the literalists, the biblicists, the people of the Book. For them, the proper (that is, traditional) interpretation of Scripture would let them maintain their identity if the Temple and its sacrifices were ever lost again, as they had been during Israel’s exile. The Sadducees were as pragmatic as the Pharisees were pietistic. They were concerned about the Temple: maintaining it, keeping it operational, making sure the sacrifices continued. This meant playing nicely with Rome, who was the empire du jour. They made most of the laws and worked with Rome to make sure taxes were collected and rebellions were discouraged. How scandalous it must have sounded when John dismissed their heritage. “God can raise up children of Abraham out of the rocks.” And, to make it worse, “The ax is already at the root of the trees.” There’s just no way to make that sound positive. Look, I think your spiritual heritage matters. It forms you. Gives you categories to help you grow and mature. It teaches you character and traditions that give you an anchor point in the world. But if you never get to a point where you run that heritage through some tough questions and discover that it comes up a little lacking, you’ll never look through it and past it to find Jesus. Point is, I’m invested in my heritage. But I’m reminded by Suleiman — and John the Baptist — that God can raise up 4th generation, properly baptized Church of Christ people who have rarely missed church, are graduates of “our” universities, and who have degrees that affirm they can read the Bible in the original languages at about a “C” average out of rocks. And, you know, he could do it without the rocks too. I’m invested in my heritage, I’m thankful for it, but the instant it becomes more important to me than Jesus I ought to be willing to let it go. 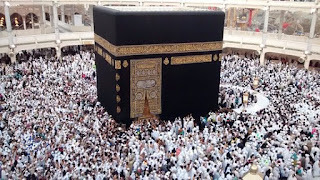 God can raise up Muslims who travel to Mecca out of the rocks. So can he raise up conscientious Catholics, earnest Episcopalians, pious Presbyterians. He can create out of the pea gravel in your landscaping good evangelicals who vote Republican, or good AME folks who vote Democrat. He can fill megachurches with celebrity pastors with a wave of his hand (and it sometimes seems as though he does.) Spiritual heritage doesn’t impress him, it doesn’t force his blessing, and it doesn’t make us more special than anyone else. If we find our way to him, it will not be ultimately be because our spiritual heritage (though it can help). It will be because we’ve recognized in our own lives what's always been true: that God’s ax is at the root of the tree, that he’s looking for fruitfulness, and that confusing heritage with faith will only keep God at a distance. If we find our way to him it will only be because he has come to us at Jesus. At best, your heritage can point you to him. At worst, it may point you away.